2003-05-15 Assigned to PHARMACIA CORPORATION reassignment PHARMACIA CORPORATION ASSIGNMENT OF ASSIGNORS INTEREST (SEE DOCUMENT FOR DETAILS). Assignors: MASFERRER, JAIME, O'NEAL, JANET M.
The current invention provides methods to treat or prevent carbonic anhydrase mediated diseases or disorders. 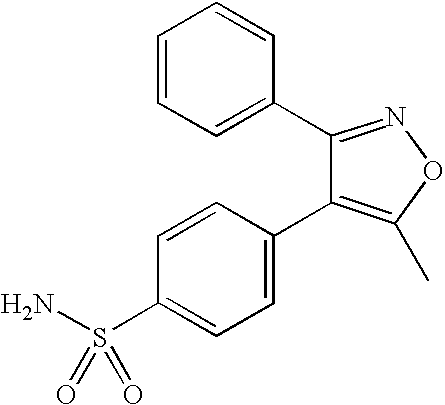 The method generally comprises administering a tricyclic compound having a sulfonamide group to a subject wherein the compound inhibits carbonic anhydrase. This application is a continuation in part of application Ser. No. 10/213,793 filed on Aug. 7, 2002, which claims priority from provisional application Serial No. 60/311,561 filed on Aug. 10, 2001, both of which are hereby incorporated by reference in their entirety. Carbonic anhydrase (CA), also called carbonate dehydratase, catalyzes the hydration of carbon dioxide in the reaction CO 2+H2O→HCO− 3+H+. CA is highly ubiquitous in nature (e.g. being present in animals, plants and certain bacteria) and may exist as a number of different isoforms within the same species. For example, eight enzymatic and evolutionarily related forms of CA are currently known to exist in humans: three cytosolic isozymes (CAI, CAII, and CAIII), two membrane-bound forms (CAIV and CAVII), a mitochondrial form (CAV), a secreted salivary form (CAVI) and an isozyme that has not presently been characterized. CA is crucial for a number of physiological functions. In one such function, CA is necessary to maintain pH homeostasis. One means by which the body maintains pH homeostasis, despite the constant influx of acids from both dietary and metabolic sources, is through the use of a number of intracellular and extracellular buffers, such as HCO 3 −. By catalyzing the breakdown of CO2 and H2O, CA helps maintain the body's buffering capacity by regenerating HCO3 −. Moreover, in the kidneys, the reabsorption of HCO3 − in the renal proximal tubule is catalyzed by CA, which combines CO2 with the OH− ion that results from the splitting of water. CA is also one of the key enzymes responsible for electrolyte secretion in a variety of tissues. By way of example, CA in the extracellular boundary layer of sarcolemma facilitates CO2 transport via the catalyzed hydration of CO2, thus maintaining the PCO2 gradient across the sarcolemma, and H+ released in that reaction protonates excreted NH3 − which helps maintain the PNH3 gradient (Henry, R. P. et al. (1997) Am. J. Physiol. 262(6/2):R1754-R1761). By way of further example, in the placenta, CA may provide ions for exchange with Na+, K+, and Cl− in transepithelial movement of ions and fluid, as well as facilitating CO2 diffusion. CA can also be active in intermediary metabolism, such as glucorieogenesis, lipogenesis, ureagenesis and fatty acid synthesis (Ridderstrale, Y. (1997) Microsc. Res. Tech. 38(1-2):115-124). Therapeutic interventions in a number of diseases involve altering CA activity. Ophthalmic disorders are commonly treated with carbonic anhydrase inhibitors such as acetazolamide. 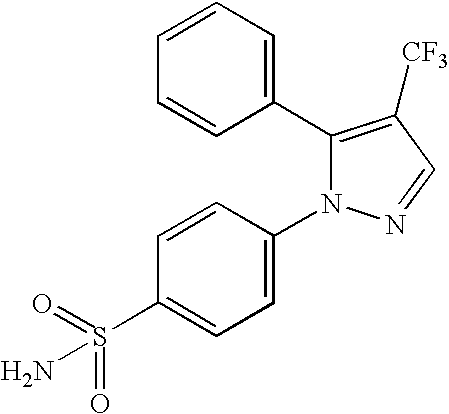 Carbonic anhydrase inhibitors are also used to treat chronic renal failure (Suki, W. N. (1997) Kidney Int. Suppl. 59:S33-S35), Parkinson's Disease and tardive dyskinesia (Cowen, M. A. et al. (1997) J. Clin. Pharmacol. 17(3):190-193), and epileptic seizures uncontrolled by other marketed agents (Reiss, W. G. (1996) Ann. Pharmacother. 30(5):514-519). Moreover, inhibition of CA has also been shown to be an effective treatment for several types of neoplasia. 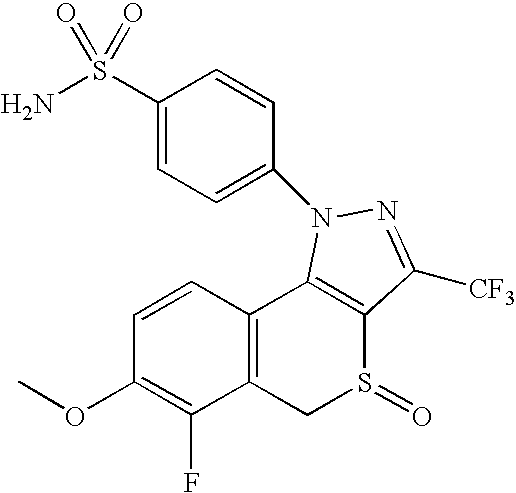 For example, sulfonamide carbonic anhydrase inhibitors have been shown to inhibit cell growth in leukemia, non-small cell lung cancer, ovarian cancer, melanoma, colon, CNS, renal, prostate and breast cancer cell lines. 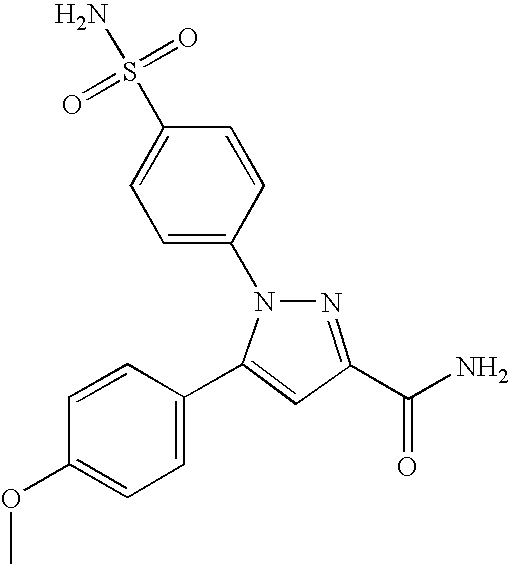 (C. Supuran,et al,  Eur.J.Med.Chem, 35: 867-874 (2000)). 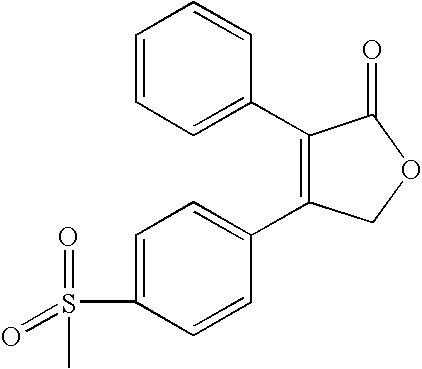 R 4 is selected from the group consisting of hydrogen, hydrocarbyl and substituted hydrocarbyl. 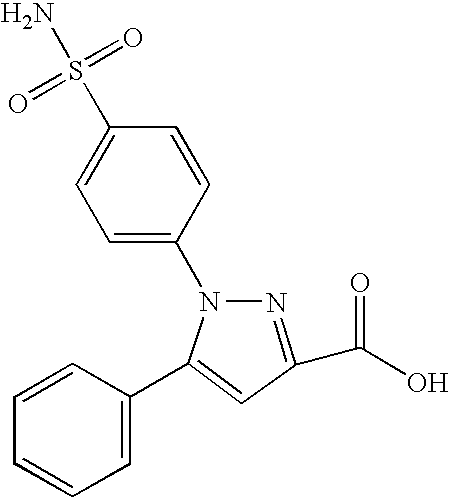 R 2 is selected from the group consisting of hydrogen, halo, acyl, carboxyl, hydroxyl, amino, cyano, hydrocarbyl, substituted hydrocarbyl, heterocyclyl, cycloalkyl, cycloalkenyl and aryl, wherein R2 is optionally substituted with one or more substituents selected from oxo, acyl, hydrocarbyl, substituted hydrocarbyl, cyano, carboxyl, hydroxyl, amino, nitro, aminocarbonyl, aminosulfonyl and halo. The term “aminocarbonyl” is an amide group of the formula —C(═O)NH 2. The term “carbonic anhydrase” as used herein refers to any isoform of the metalloprotein enzyme that catalyzes the interconversion of CO 2and H2CO3 (CO2+O2→HCO2 −+H+). The terms “cyclooxygenase-2” and “COX-2 as used interchangeably herein refer to the inducible isoform of the enzyme cyclooxygenase. 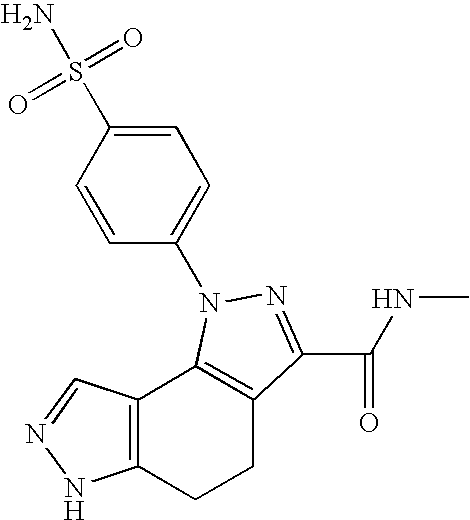 As used herein, the terms “cyclooxygenase-2 selective inhibitor” and “COX-2 selective inhibitor” are used interchangeably herein refer to a therapeutic compound that inhibits cyclooxygenase-2 more than it inhibits cyclooxygenase-1. 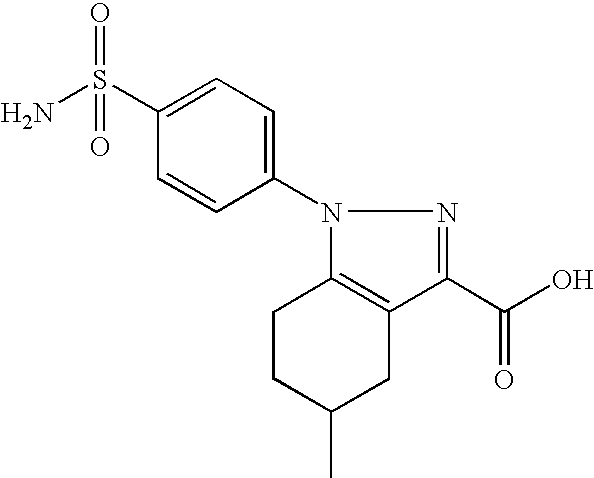 The term “cyclooxygenase-2 inhibitor” or “COX-2 inhibitor” refers to any compound that inhibits the COX-2 enzyme, without regard to the extent to which it inhibits COX-1. 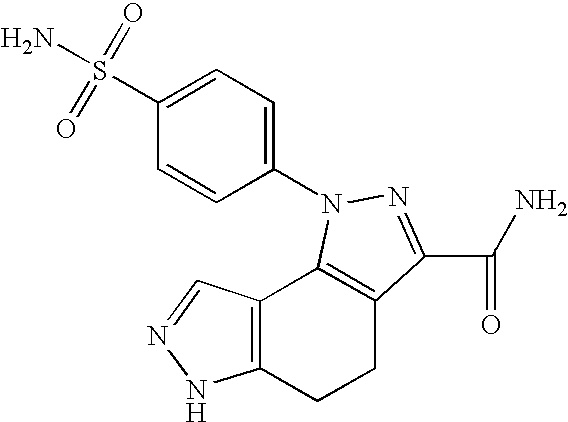 Suitable cyclooxygenase-2 selective inhibitors useful in the present invention are those compounds that have a cyclooxygenase-2 IC 50 of less than about 0.2 μM, and also have a selectivity ratio of cyclooxygenase-2 inhibition over cyclooxygenase-1 inhibition of at least 50, and more preferably of at least 100. 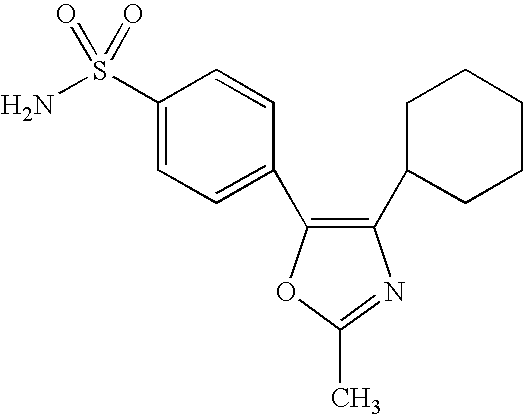 Even more preferably, the cyclooxygenase-2 selective inhibitor compounds have a cyclooxygenase-1 IC50 of greater than about 1 μM, and more preferably of greater than 10 μM. The term “hydrido” is a single hydrogen atom (H). This hydrido radical may be attached, for example, to an oxygen atom to form a hydroxyl radical or two hydrido radicals may be attached to a carbon atom to form a methylene (—CH 2—) radical. The term “sulfonyl”, whether used alone or linked to other terms such as alkylsulfonyl, is divalent radicals—SO 2—. “Alkylsulfonyl” is a alkyl radical attached to a sulfonyl radical, where alkyl is defined as above. More preferred alkylsulfonyl radicals are “lower alkylsulfonyl” radicals having one to six carbon atoms. 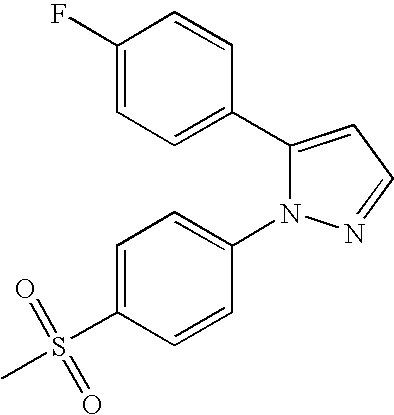 Examples of such lower alkylsulfonyl radicals include methylsulfonyl, ethylsulfonyl and propylsulfonyl. The “alkylsulfonyl” radicals may be further substituted with one or more halo atoms, such as fluoro, chloro or bromo, to provide haloalkylsulfonyl radicals. 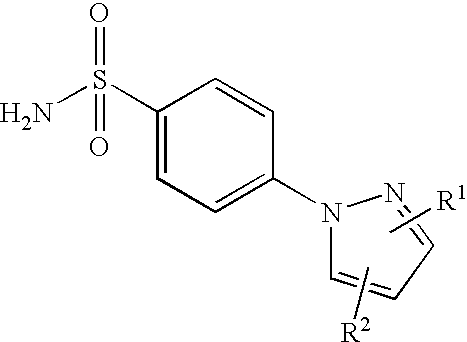 The terms “sulfamyl”, “aminosulfonyl” and “sulfonamidyl” are NH2O2S—. wherein X, A, R 1 and R2 are as defined for compounds having formula (I). In one embodiment for compounds having formula (I) or (II), X 1, X2, X3, X4, and X5 are selected to provide a 5-membered heterocyclic or carbocyclic ring where each of X1, X2, X3, X4, and X5 are carbon, nitrogen, oxygen or sulfur. In one alternative of this embodiment, X1, X2, X3, X4, and X5 are selected to provide an optionally substituted cyclopentane or cyclopentene ring. In another alternative of this embodiment, X1, X2, X3, X4, and X5 are selected to provide an optionally substituted furan, thiophene, pyrrole, 2H-pyrrole, 3H-pyrrole, pyrazole, 2H-imidazole, 1,2,3-triazole, 1,2,4-triazole, 1,2-dithiole, 1,3-dithiole, 3H-1,2-oxathiole, oxazole, thiazole, isothiazole, 1,2,3-oxadiazole, 1,2,4-oxadiazole, 1,2,5-oxadiazole, 1,3,4-oxadiazole, 1,2,3,4-oxatriazole, 1,2,3,5-oxatriazole, 3H-1,2,3-oxadiazole, 1,2,4-dioxazole, 1,3,2-dioxazole, 1,3,4-dioxazole, 5H-1,2,5-oxathiazole or a 1,3-oxathiole ring. 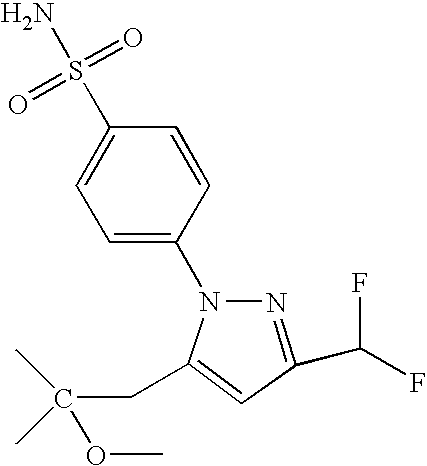 Alternatively for compounds having formula (I) or (II), X 1, X2, X3, X4, X5 and X6 are selected to provide a 6-membered heterocyclic, heteroaromatic, aromatic or carbocyclic ring where each of X1, X2, X3, X4, X5, and X6 are carbon, nitrogen, oxygen or sulfur. In one alternative of this embodiment, X1, X2, X3, X4, X5, and X6 are selected to provide an optionally substituted cyclohexane or cyclohexene ring. 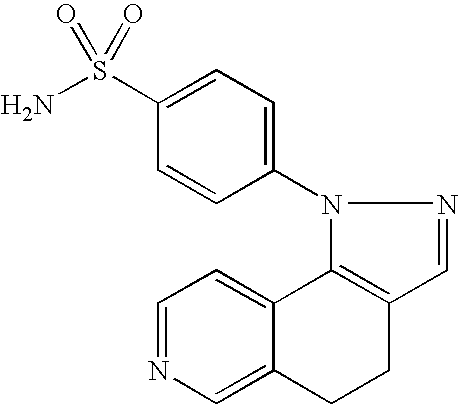 In another alternative of this embodiment, X1, X2, X3, X4, X5, and X6 are selected to provide an optionally substituted benzene, 2H-pyran, 4H-pyran, 2-pyrone, 4-pyrone, 1,2-dioxin, 1,3-dioxin, pyridine, pyridazine, pyrimidine, pyrazine, piperazine, 1,3,5-triazine, 1,2,4-triazine, 1,2,3-triazine, 4H-1,2-oxazine, 2H-1,3-oxazine, 6H-1,3-oxazine, 6H-1,2-oxazine, 1,4-oxazine, 2H-1,2-oxazine, 4H-1,4-oxazine, 1,2,5-oxathiazine, 1,4-oxazine, o-isoxazine, p-isoxazine, 1,2,5-oxathiazine, 1,2,6-oxathiazine, 1,4,2-oxadiazine, 1,3,5,2-oxadiazine or a tetrahydro-p-isoxazine ring. 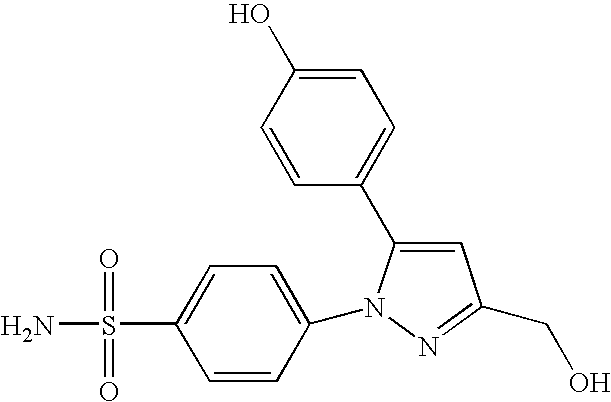 R 2 is selected from the group consisting of hydrogen, halo, alkyl, alkenyl, alkynyl, oxo, cyano, carboxyl, cyanoalkyl, heterocyclyloxy, alkyloxy, alkylthio, alkylcarbonyl, cycloalkyl, aryl, haloalkyl, heterocyclyl, cycloalkenyl, aralkyl, heterocyclylalkyl, acyl, alkylthioalkyl, hydroxyalkyl, alkoxycarbonyl, arylcarbonyl, aralkylcarbonyl, aralkenyl, alkoxyalkyl, arylthioalkyl, aryloxyalkyl, aralkylthioalkyl, aralkoxyalkyl, alkoxyaralkoxyalkyl, alkoxycarbonylalkyl, aminocarbonyl, aminocarbonylalkyl, alkylaminocarbonyl, N-arylaminocarbonyl, N-alkyl-N-arylaminocarbonyl, alkylaminocarbonylalkyl, carboxyalkyl, alkylamino, N-arylamino, N-aralkylamino, N-alkyl-N-aralkylamino, N-alkyl-N-arylamino, aminoalkyl, alkylaminoalkyl, N-arylaminoalkyl, N-aralkylaminoalkyl, N-alkyl-N-aralkylaminoalkyl, N-alkyl-N-arylaminoalkyl, aryloxy, aralkoxy, arylthio, aralkylthio, alkylsulfinyl, alkylsulfonyl, aminosulfonyl, alkylaminosulfonyl, N-arylaminosulfonyl, arylsulfonyl, and N-alkyl-N-arylaminosulfonyl. 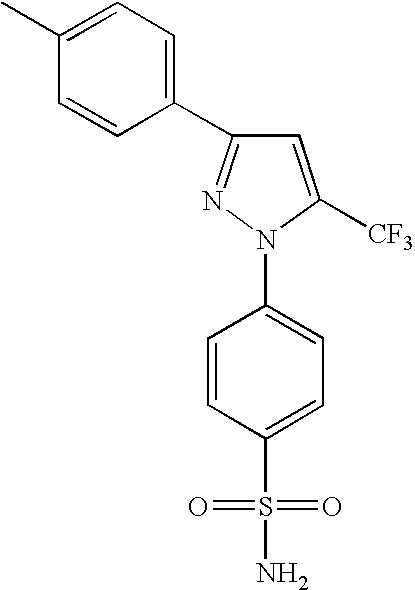 wherein A, R 1, R2, R3 and R4 are as defined for compounds having formula (I). In still another embodiment for carbonic anhydrase inhibitors corresponding to any of formulas (I)-(IV), A is selected from thienyl, oxazolyl, furyl, pyrrolyl, thiazolyl, imidazolyl, isothiazolyl, isoxazolyl, pyrazolyl, cyclopentenyl, phenyl, and pyridyl; R 1 and R2 are as described for any of the embodiments for compounds having formula (I); and R3, and R4 when present, are each hydrogen. 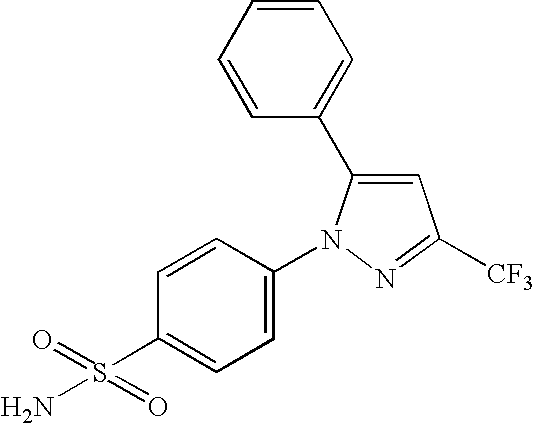 In a further alternative of this embodiment, A is pyrazolyl or isoxazolyl. 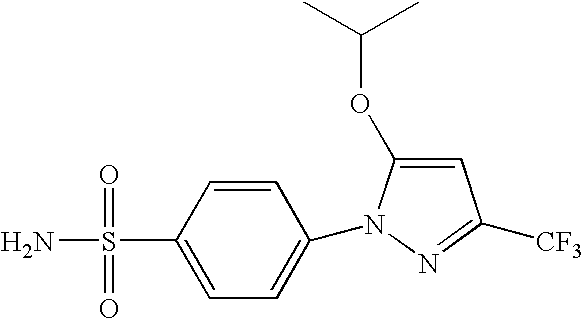 In yet another alternative of this embodiment, A is pyrazolyl. 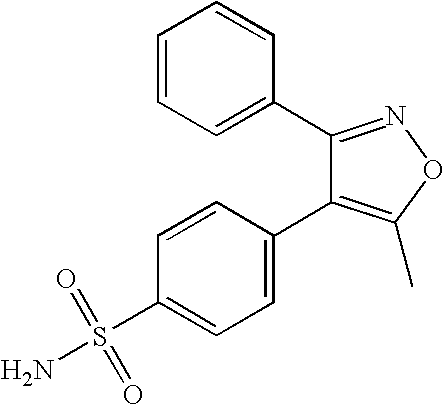 In still another alternative of this embodiment, A is isooxazolyl. 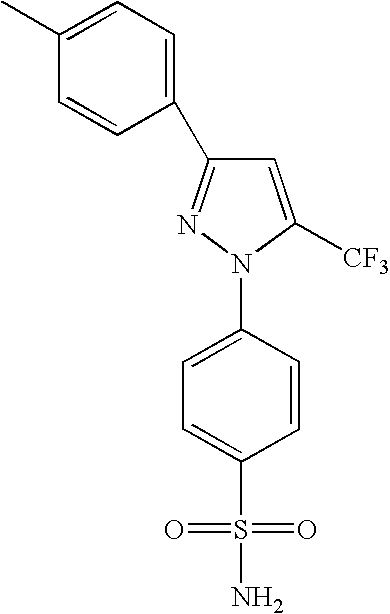 wherein R 1 and R2 are as defined for any embodiment for compounds corresponding to formula (I). 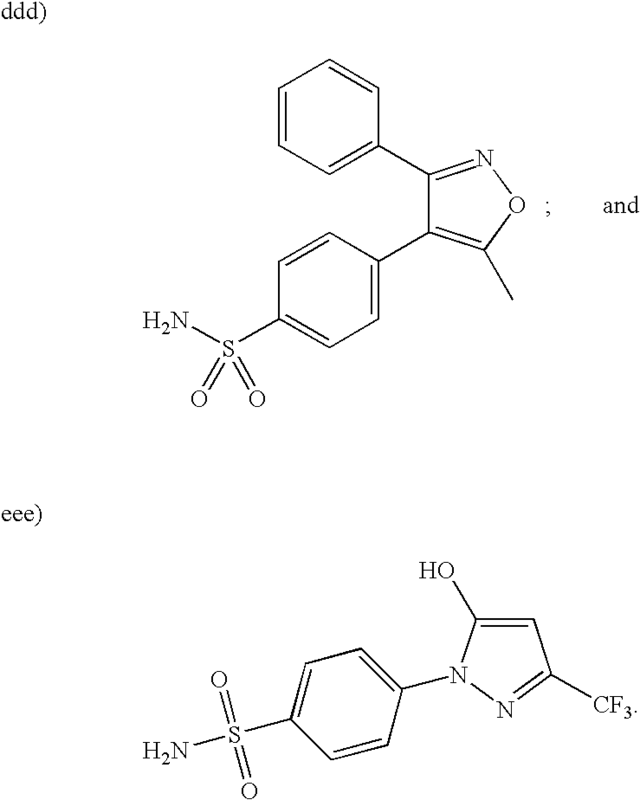 wherein R 1 and R2 are as described for any of the embodiments for carbonic anhydrase inhibitors having formula (I). In another embodiment, the aqueous humor modulating agent is a prostaglandin analog. Typically, suitable prostaglandin analogs include any analogs that are similar in structure and function to prostaglandin, which lower IOP. In one alternative of this embodiment, the prostaglandin analog is a prostaglandin FP receptor antagonist. In another alternative of this embodiment, the prostaglandin analog is a prostaglandin F 2a analog. 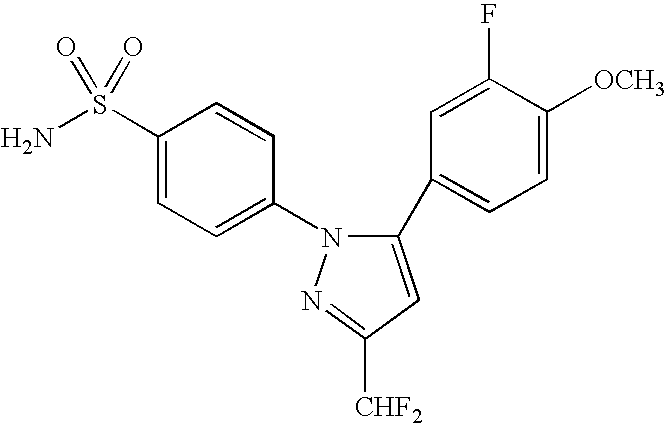 In one embodiment, the prostaglandin F2a analog is lanaprost. 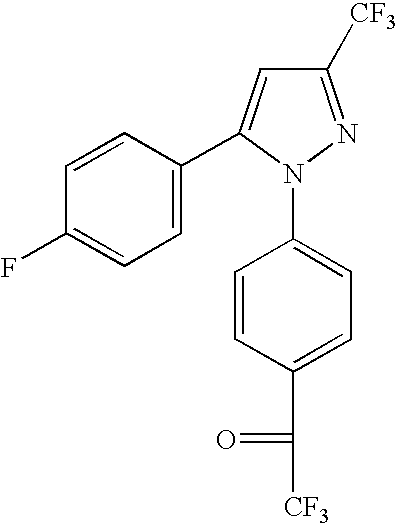 In another embodiment, the F2a analog is travoprost. 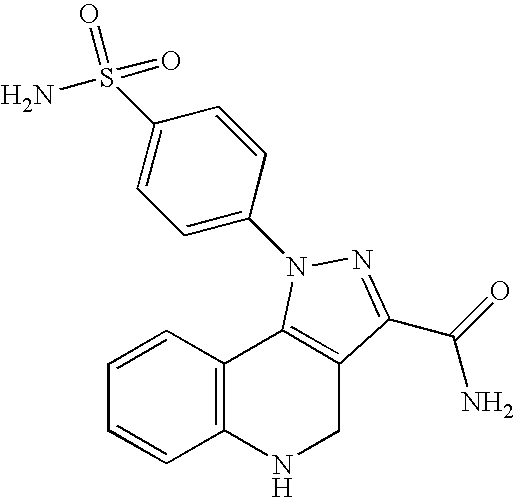 In still a further alternative of this embodiment, the prostaglandin analog is unoprostone. 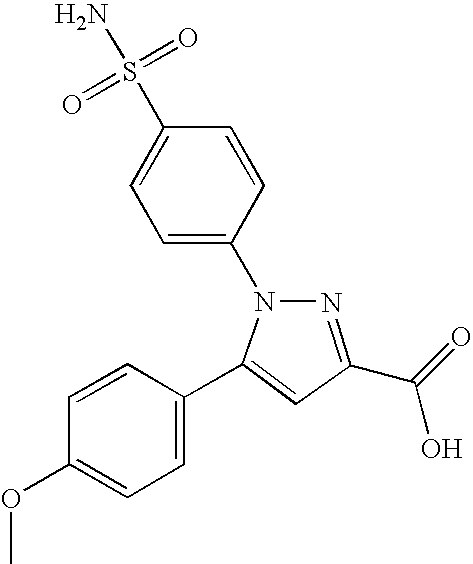 In a further alternative of this embodiment, the prostaglandin analog is a prostamide. 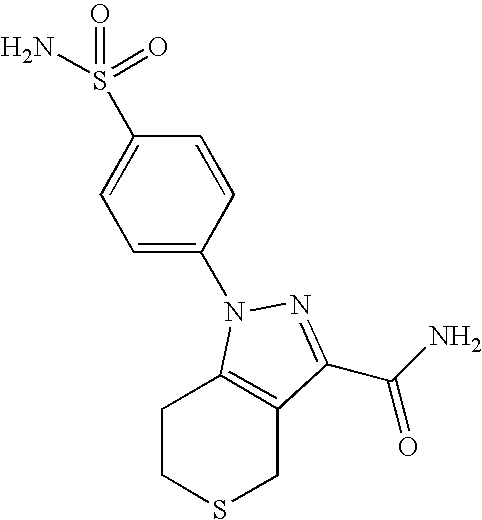 Generally speaking, the prostamide employed may be any naturally occurring or synthetic prostamide. 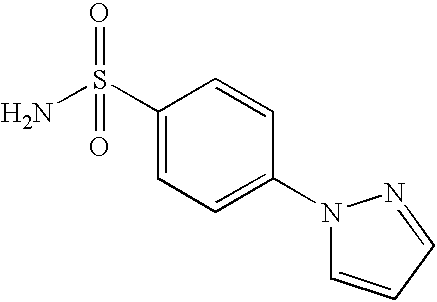 In one embodiment, the prostamide is the synthetic analog bimatoprost. The preparation and pharmaceutical profiles of several prostaglandin and prostaglandin analogs, including cloprostenol, fluprostenol, latanoprost, and travoprost, are more fully described in U.S. Pat. No. 5,510,383, which is hereby incorporated by reference in its entirety. 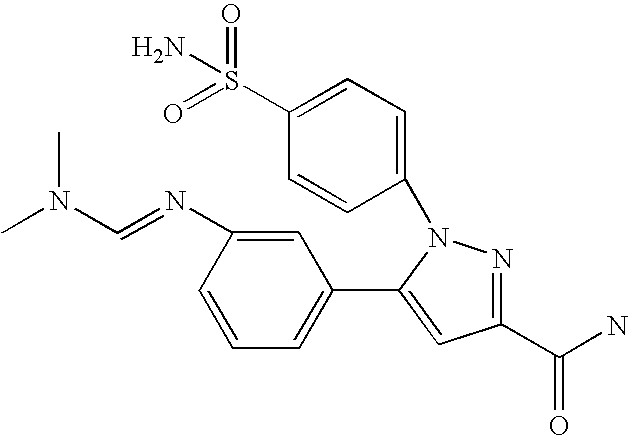 In a further aspect, the aqueous humor modulating agent is a beta adrenergic receptor antagonist. 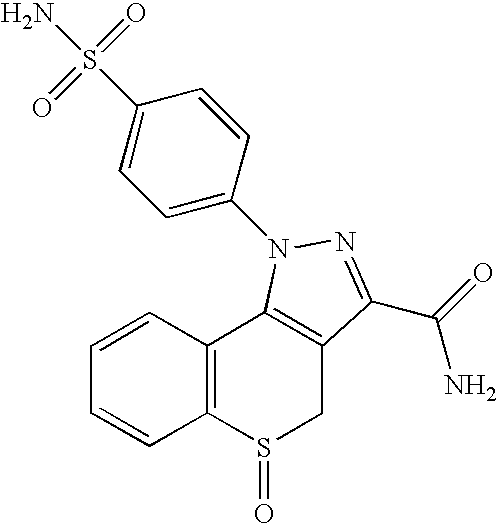 Beta adrenergic receptor antagonist bind beta-adrenergic receptors such as the beta 1 adrenergic receptor or the beta2 adrenergic receptor. 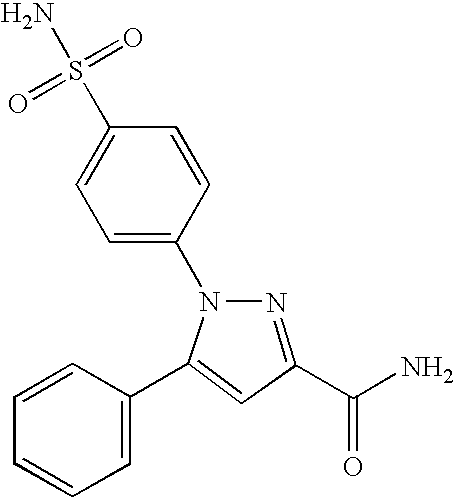 By binding to these receptors, the beta adrenergic receptor antagonist decrease the ability of the body's own natural epinephrine to bind to those receptors, leading to inhibition of various processes in the body's sympathetic system, including a reduction in aqueous humor secretion by ciliary tissues in the eye. 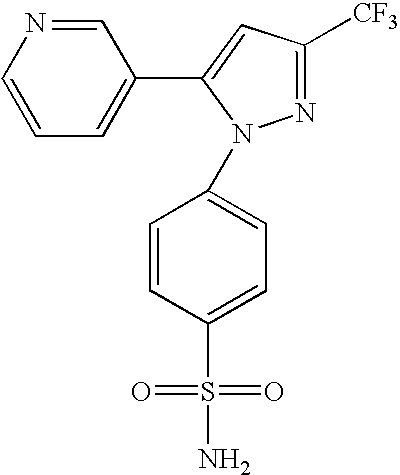 Generally speaking, any beta adrenergic receptor antagonist capable of lowering IOP by altering the production, inflow or outflow of aqueous humor may be used in the composition. 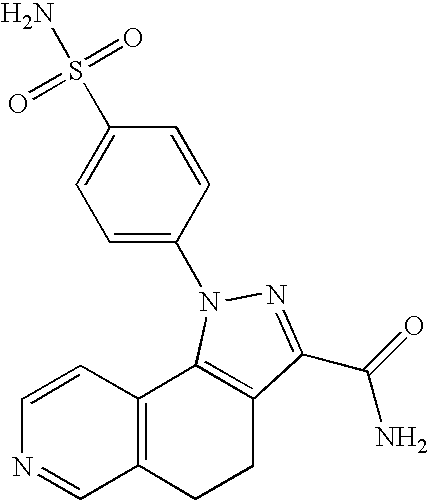 In some embodiments, the beta adrenergic receptor antagonist may be selective for the beta1 adrenergic receptor. By way of example, suitable selective beta1 adrenergic receptor antagonist include betaxolol and its enantiomer levobetaxolol. In other embodiments, the beta adrenergic receptor antagonist may be non-selective, blocking both the beta1 adrenergic receptor and the beta2 adrenergic receptor. Examples of suitable non-selective beta adrenergic receptor antagonist include timolol, levobunolol, carteolol and metipranolol. In a further aspect, the aqueous humor modulating agent is a carbonic anhydrase inhibitor other than a carbonic anhydrase inhibitor having any of formulas (I)-(VII). Carbonic anhydrase is involved in producing bicarbonate, which is required for aqueous humor production by the ciliary tissues in the eye. By inhibiting carbonic anhydrase, accordingly, production of aqueous humor is substantially reduced. Generally speaking, the carbonic anhydrase inhibitor may inhibit any isomer of the metalloprotein enzyme that catalyzes the interconversion of CO 2 and H2CO3 (CO2 +O2→HCO2 −+H+). Typically, however, the carbonic anhydrase inhibitor will inhibit the carbonic anhydrase I, carbonic anhydrase II or carbonic anhydrase IV isoform. 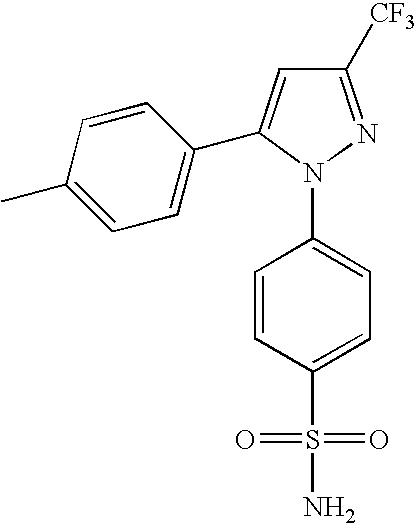 Examples of suitable carbonic anhydrase inhibitors include acetazolamide, methazolamide, dorzolamide hydrochloride ophthalmic solution, dorzolamide hydrochloride-timolol maleate ophthalmic solution, brinzolamide hydrochloride, dorzolamide, and brinzolamide. Generally speaking, a compound having any of formulas (I)-(VII) may be administered by any means that will deliver a therapeutically effective dose. Moreover, when administered with another agent as a part of a combination therapy, the agents useful in the practice of the present invention can be formulated into pharmaceutical compositions and administered separately, either simultaneously or sequentially. Alternatively, each agent can be formulated into a single composition comprising both agents. 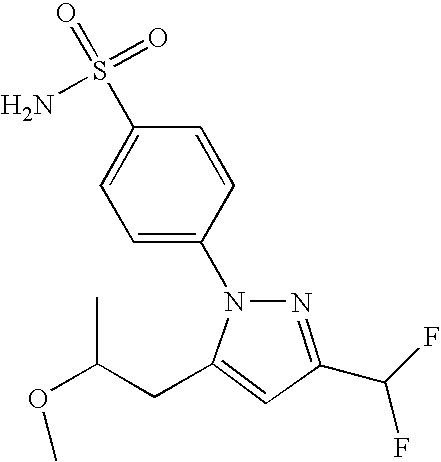 Irrespective of whether both agents are formulated into a single composition or formulated with each agent in a separate composition, the composition may be administered by any means that will deliver a therapeutically effective dose of both agents, as detailed herein or as otherwise known in the art. For example, formulation of agents is discussed in Hoover, John E.,  Remington's Pharmaceutical Sciences, Mack Publishing Co., Easton, Pa. (1975), and Liberman, H. A. and Lachman, L., Eds., Pharmaceutical Dosage Forms, Marcel Decker, New York, N.Y. (1980). In a related composition, the agent typically has a D 90 particle size of about 10 to about 2000 nm, wherein about 25% to 100% by weight of the particles are nanoparticles. “D90” is a linear measure of diameter having a value such that 90% by volume of particles in the composition, in the longest dimension of the particles, are smaller than that diameter. For practical purposes a determination of D90 based on 90% by weight rather than by volume is generally suitable. The ophthalmic composition in some embodiments can be an aqueous suspension of an agent of low water solubility, wherein typically the agent is present predominantly or substantially entirely in nanoparticulate form. Without being bound by theory, it is believed that release of the agent from nanoparticles is significantly faster than from a typical “micronized” composition having a D 90 particle size of, for example, about 10,000 nm or greater. In another embodiment, an aqueous suspension composition of the invention can comprise a first portion of the agent in nanoparticulate form, to promote relatively rapid release, and a second portion of the agent having a D  90 particle size of about 10,000 nm or greater, that can provide a depot or reservoir of the agent in the treated eye for release over a period of time, for example about 2 to about 24 hours, more typically about 2 to about 12 hours, to promote sustained therapeutic effect and permit a reduced frequency of administration. A class of solubilizing agents suitable for use in solution and solution/suspension compositions of the invention is the cyclodextrins. Suitable cyclodextrins can be selected from α-cyclodextrin, α-cyclodextrin, α-cyclodextrin, alkylcyclodextrins (e.g., methyl-α-cyclodextrin, dimethyl-α-cyclodextrin, diethyl-α-cyclodextrin), hydroxyalkylcyclodextrins (e.g., hydroxyethyl-α-cyclodextrin, hydroxypropyl-α-cyclodextrin), carboxyalkylcyclodextrins (e.g., carboxymethyl-α-cyclodextrin), sulfoalkylether cyclodextrins (e.g., sulfobutylether-α-cyclodextrin), and the like. 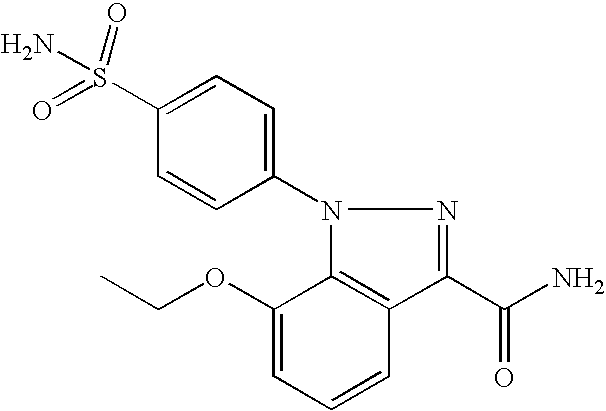 Ophthalmic applications of cyclodextrins have been reviewed by Rajewski & Stella (1996),  Journal of Pharmaceutical Sciences, 85, 1154, at pages 1155-1159. 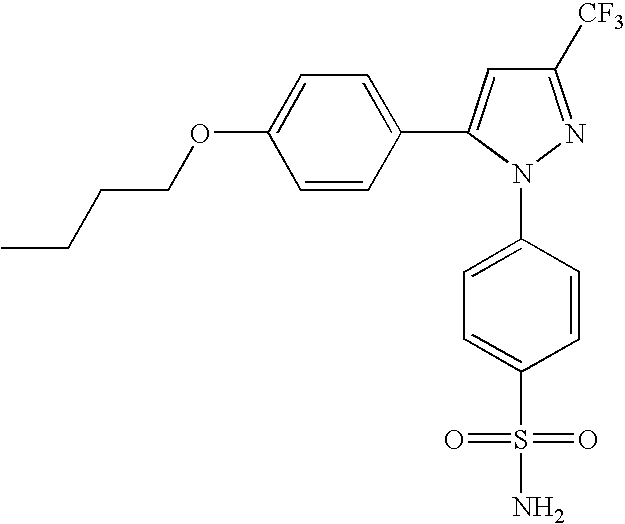 If desired, complexation of an agent by a cyclodextrin can be increased by addition of a water-soluble polymer such as carboxymethylcellulose, hydroxypropyl methylcellulose or polyvinylpyrrolidone, as described by Loftsson (1998), Pharmazie, 53, 733-740. 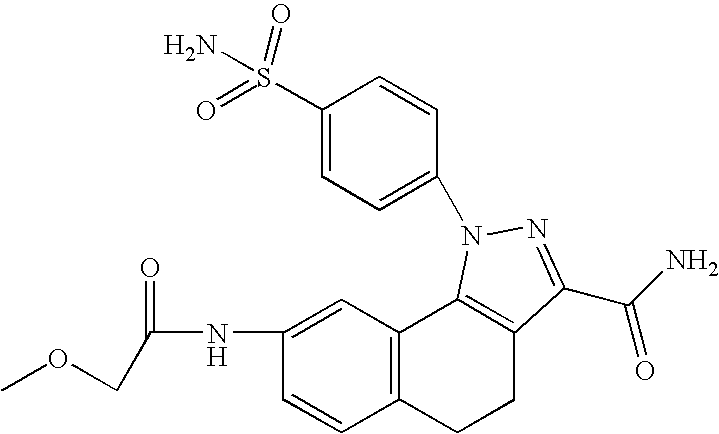 In addition, the carbonic anhydrase inhibitors can be formulated into pharmaceutical compositions and administered by any means that will deliver a therapeutically effective dose. 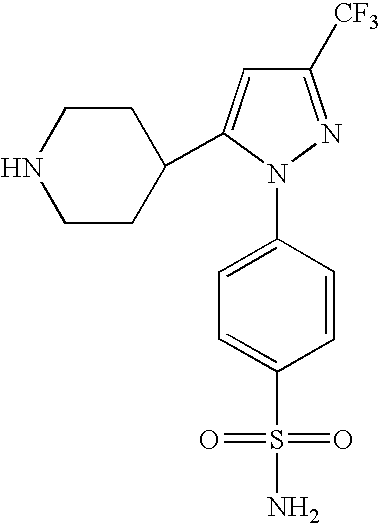 Generally speaking, suitable routes of administration include any means that results in contact of these compounds with their site of action in the subject's body. More specifically, suitable routes of administration include oral, parenterally, by inhalation spray, rectally, intradermally, transdermally, buccal (i.e. sublingual), or topically in dosage unit formulations containing conventional nontoxic pharmaceutically acceptable carriers, adjuvants, and vehicles as desired. The term parenteral as used herein includes subcutaneous, intravenous, intramuscular, or intrasternal injection, or infusion techniques. Formulation of drugs is discussed in, for example, Hoover, John E.,  Remington's Pharmaceutical Sciences, Mack Publishing Co., Easton, Pa. (1975), and Liberman, H. A. and Lachman, L., Eds., Pharmaceutical Dosage Forms, Marcel Decker, New York, N.Y. (1980). 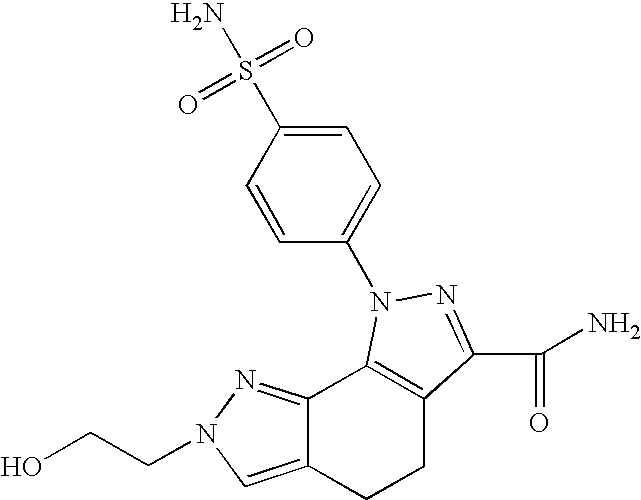 Typically, however, the compounds are administered orally. Those skilled in the art will appreciate that dosages may also be determined with guidance from Goodman & Goldman's  The Pharmacological Basis of Therapeutics, Ninth Edition (1996), Appendix II, pp. 1707-1711 and from Goodman & Goldman's The Pharmacological Basis of Therapeutics, Tenth Edition (2001), Appendix II, pp. 475-493. 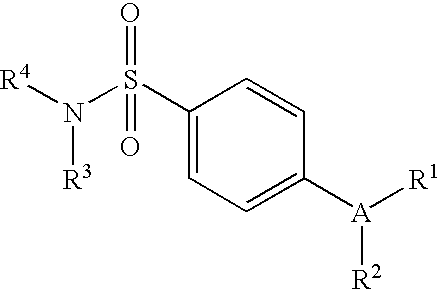 A reaction mixture consisting of 2 Wibur-Anderson units of human carbonic anhydrase II (Signma, C-6165), 4 mM p-nitrophenol acetate (Sigma, N-8130), 20% DMSO, 0.1 M NA 2SO4 and 50 mM Tris-HCL, pH 7.6 in a total volume of 200 microliters was prepared. Each inhibitor indicated in Table 2 or 3 below was tested. 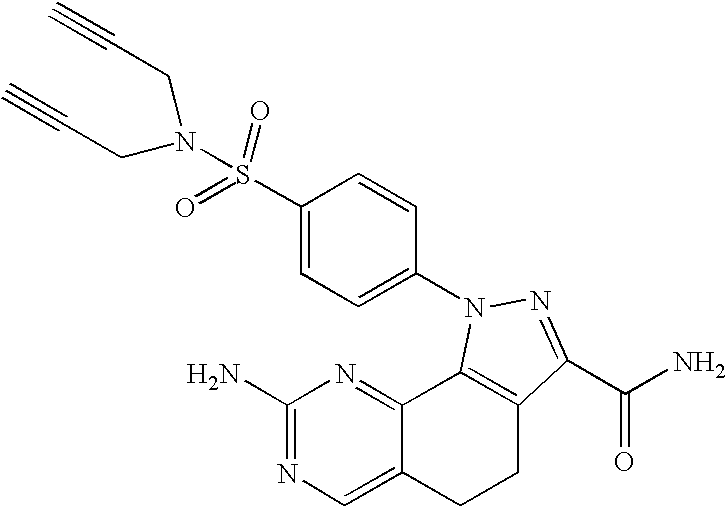 Final concentrations of each inhibitor ranged from 1 picomolar to 1 micromolar. Control samples that included either no inhibitor or no enzyme were also performed. The admixture of substrate and enzyme initiates the enzyme reaction. The enzyme activity was monitored by absorbance at 405 nm in a kinetic mode in a plate reader at room temperature and expressed as the change in mOD 405 nm per minute. 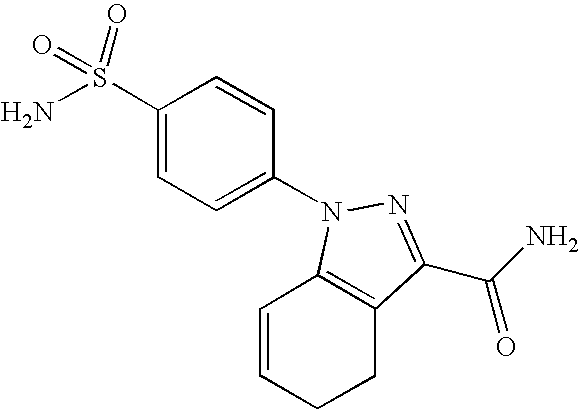 The inhibition at each inhibitor concentration was measured in triplicate. The IC50 value was then derived using the GraphPad Prism curve fitting software. Results for each inhibitor tested are detailed in Table 2 and 3. Table 2 depicts the IC50 expressed as a micromolar concentration of the indicated inhibitor added to the reaction mixture. Table 3 depicts the mean IC50 value expressed as a nanomolar concentration of the indicated inhibitor added to the reaction mixture. The compound number listed in Table 2 and 3 corresponds with the same compound number detailed in Table 1. 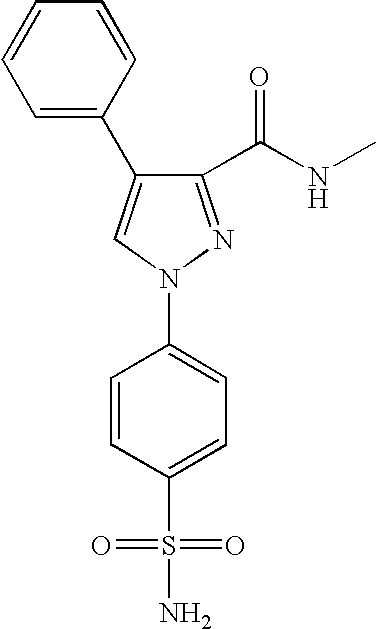 Compound N inhibitor added Structure? 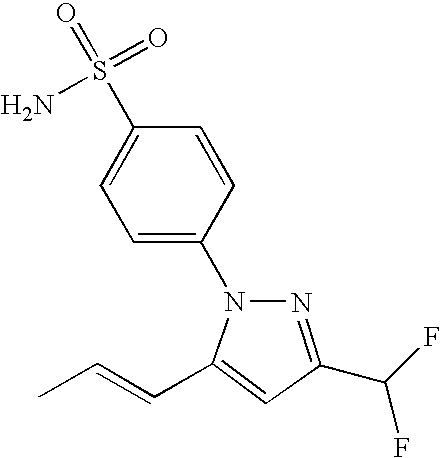 All Compounds tested containing a sulfonamide inhibited CA II. 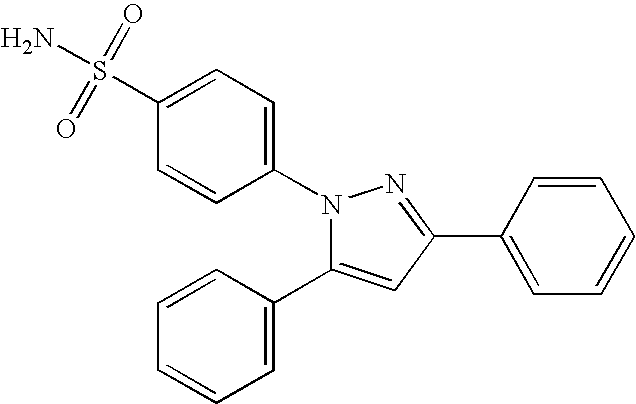 The selective COX-2 inhibitors, celecoxib and valdecoxib, inhibited CA II activity with IC 50s of 0.14 μM and 0.33 μM, respectively. 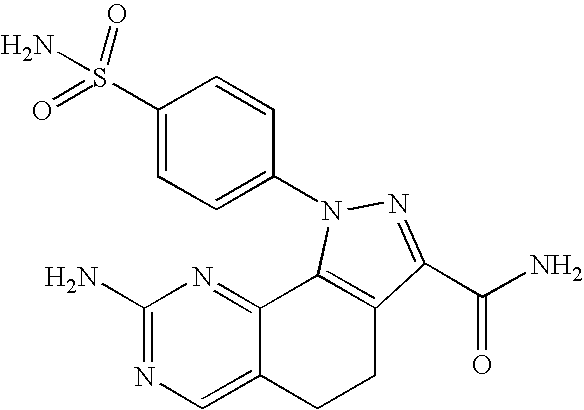 The selective COX-2 inhibitor rofecoxib did not inhibit the enzyme up to 100 μM. 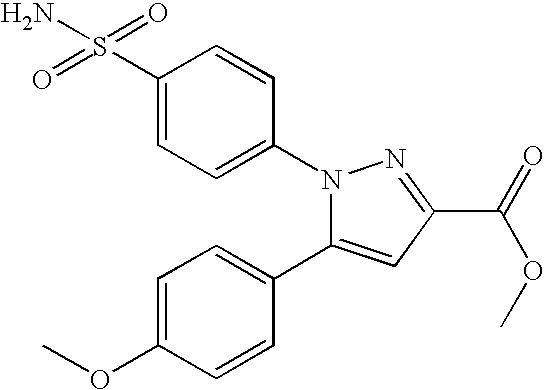 The known inhibitor of carbonic anhydrase, acetazolamide, and Compound 1, blocked CA II activity with IC50s of 0.03 μM and 0.01 μM, respectively. 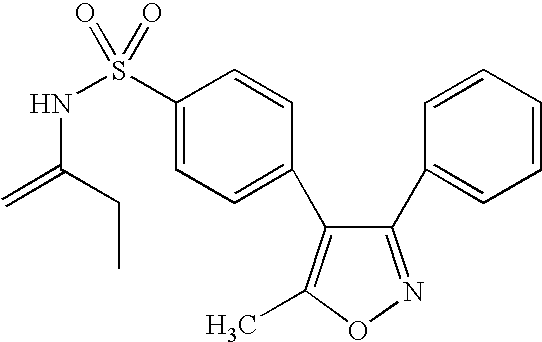 R4 is selected from the group consisting of hydrogen, hydrocarbyl and substituted hydrocarbyl. 2. 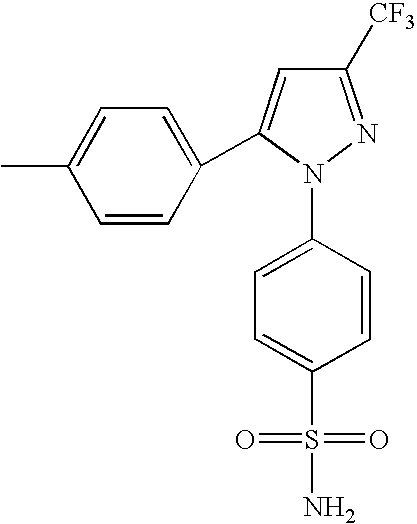 The method of claim 1 wherein X is a 5-membered ring selected from the group consisting of cyclopentane, cyclopentenefuran, thiophene, pyrrole, 2H-pyrrole, 3H-pyrrole, pyrazole, 2H-imidazole, 1,2,3-triazole, 1,2,4-triazole, 1,2-dithiole, 1,3-dithiole, 3H-1,2-oxathiole, oxazole, thiazole, isothiazole, 1,2,3-oxadiazole, 1,2,4-oxadiazole, 1,2,5-oxadiazole, 1,3,4-oxadiazole, 1,2,3,4-oxatriazole, 1,2,3,5-oxatriazole, 3H-1,2,3-oxadiazole, 1,2,4-dioxazole, 1,3,2-dioxazole, 1,3,4-dioxazole, 5H-1,2,5-oxathiazole and 1,3-oxathiole. 3. The method of claim 1 wherein X is a 6-membered ring selected from the group consisting of cyclohexane, cyclohexenebenzene, 2H-pyran, 4H-pyran, 2-pyrone, 4-pyrone, 1,2-dioxin, 1,3-dioxin, pyridine, pyridazine, pyrimidine, pyrazine, piperazine, 1,3,5-triazine, 1,2,4-triazine, 1,2,3-triazine, 4H-1,2-oxazine, 2H-1,3-oxazine, 6H-1,3-oxazine, 6H-1,2-oxazine, 1,4-oxazine, 2H-1,2-oxazine, 4H-1,4-oxazine, 1,2,5-oxathiazine, 1,4-oxazine, o-isoxazine, p-isoxazine, 1,2,5-oxathiazine, 1,2,6-oxathiazine, 1,4,2-oxadiazine, 1,3,5,2-oxadiazine, and tetrahydro-p-isoxazine. wherein A, R1, R2, R3 and R4 are as defined in claim 1. 7. 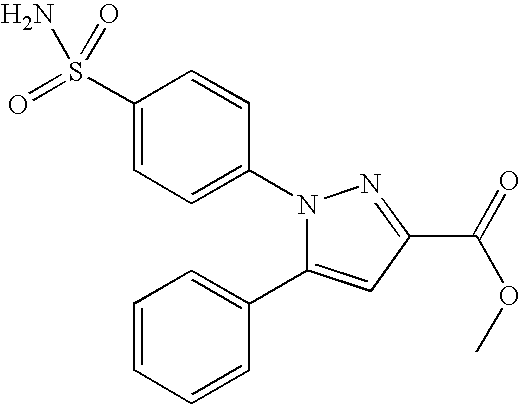 The method of claim 6 wherein A is a pyrazolyl or isoxazolyl ring and R1, R2, R3 and R4 are as defined in claim 6. 8. 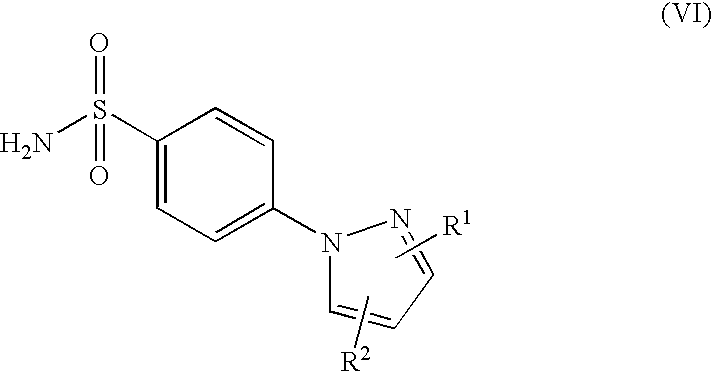 The method of claim 7 wherein A is pyrazolyl. 9. 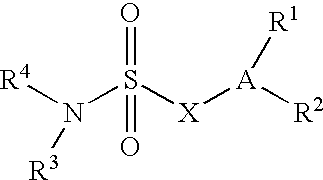 The method of claim 7 wherein A is isoxazolyl. 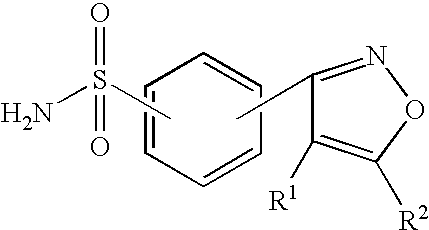 R2 is seleted from the group consisting of hydrogen, halo, acyl, carboxyl, hydroxyl, amino, cyano, hydrocarbyl, substituted hydrocarbyl, heterocyclyl, cycloalkyl, cycloalkenyl and aryl, wherein R2 is optionally substituted with one or more substituents selected from oxo, acyl, hydrocarbyl, substituted hydrocarbyl, cyano, carboxyl, hydroxyl, amino, nitro, aminocarbonyl, aminosulfonyl and halo. 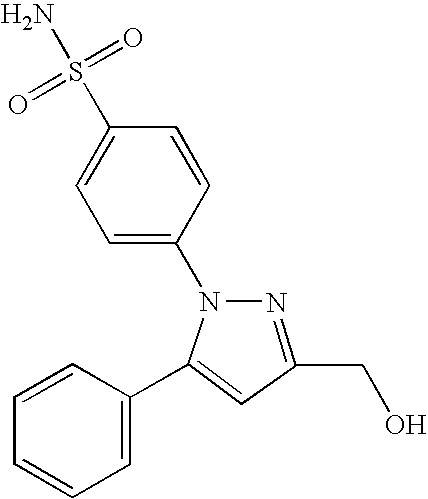 R2 is selected from the group consisting of hydrogen, halo, acyl, carboxyl, hydroxyl, amino, cyano, hydrocarbyl, substituted hydrocarbyl, heterocyclyl, cycloalkyl, cycloalkenyl and aryl, wherein R2 is optionally substituted with one or more substituents selected from oxo, acyl, hydrocarbyl, substituted hydrocarbyl, cyano, carboxyl, hydroxyl, amino, nitro, aminocarbonyl, aminosulfonyl and halo. R2 is selected from the group consisting of hydrogen, halo, alkyl, alkenyl, alkynyl, oxo, cyano, carboxyl, cyanoalkyl, heterocyclyloxy, alkyloxy, alkylthio, alkylcarbonyl, cycloalkyl, aryl, haloalkyl, heterocyclyl, cycloalkenyl, aralkyl, heterocyclylalkyl, acyl, alkylthioalkyl, hydroxyalkyl, alkoxycarbonyl, arylcarbonyl, aralkylcarbonyl, aralkenyl, alkoxyalkyl, arylthioalkyl, aryloxyalkyl, aralkylthioalkyl, aralkoxyalkyl, alkoxyaralkoxyalkyl, alkoxycarbonylalkyl, aminocarbonyl, aminocarbonylalkyl, alkylaminocarbonyl, N-arylaminocarbonyl, N-alkyl-N-arylaminocarbonyl, alkylaminocarbonylalkyl, carboxyalkyl, alkylamino, N-arylamino, N-aralkylamino, N-alkyl-N-aralkylamino, N-alkyl-N-arylamino, aminoalkyl, alkylaminoalkyl, N-arylaminoalkyl, N-aralkylaminoalkyl, N-alkyl-N-aralkylaminoalkyl, N-alkyl-N-arylaminoalkyl, aryloxy, aralkoxy, arylthio, aralkylthio, alkylsulfinyl, alkylsulfonyl, aminosulfonyl, alkylaminosulfonyl, N-arylaminosulfonyl, arylsulfonyl, and N-alkyl-N-arylaminosulfonyl. 15. The method of claim 1 wherein the carbonic anhydrase mediated disorder is elevated intraocular pressure. 16. The method of claim 15 further comprising administering to the subject a second agent that is an aqueous humor modulating agent. 17. The method of claim 16 wherein the aqueous humor modulating agent reduces the formation of aqueous humor. 18. The method of claim 16 wherein the aqueous humor modulating agent increases outflow of aqueous humor from the anterior chamber of the eye. 19. The method of claim 16 wherein the aqueous humor modulating agent decreases inflow of aqueous humor into the anterior chamber of the eye. 20. 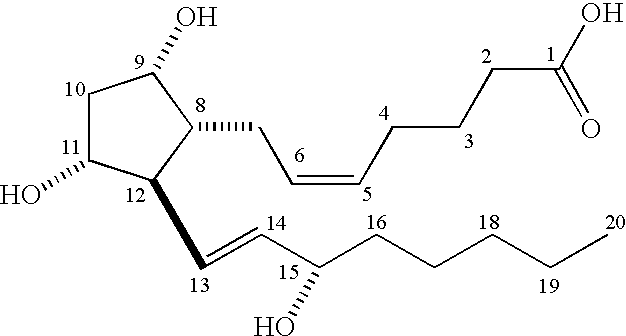 The method of claim 16 wherein the aqueous humor modulating agent is a prostaglandin or a prostaglandin analog. 21. The method of claim 20 wherein the aqueous humor modulating agent is a prostaglandin. 22. The method of claim 21 wherein the prostaglandin is selected from prostaglandin A, prostaglandin B, prostaglandin D, prostaglandin E, and prostaglandin F.
23. The method of claim 20 wherein the aqueous humor modulating agent is a prostaglandin analog. 24. 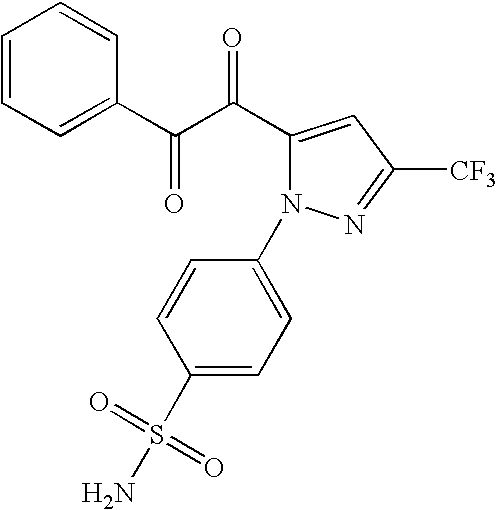 The method of claim 23 wherein the prostaglandin analog is a prostaglandin FP receptor antagonist. 25. The method of claim 23 wherein the prostaglandin analog is selected from the group consisting of latanaprost, bimatoprost, unoprostone, and travoprost. 26. The method of claim 16 wherein the aqueous humor modulating agent is a beta adrenergic antagonist. 27. 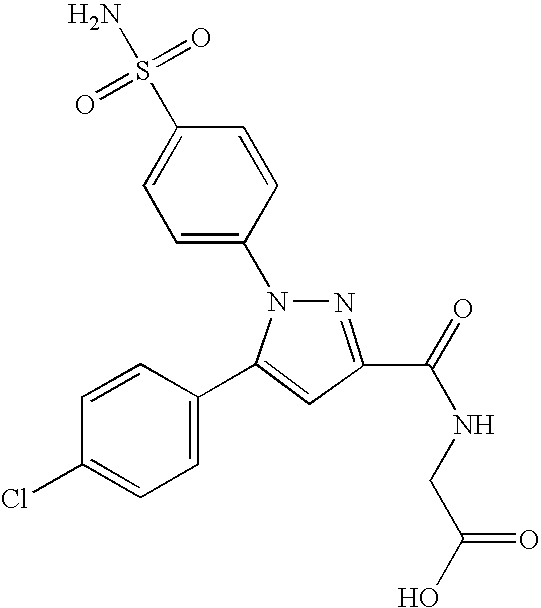 The method of claim 26 wherein the beta adrenergic antagonist is selected from the group consisting of betaxolol, carteolol, levobunolol, metipranolol, timolol, and levobetaxolol. 28. 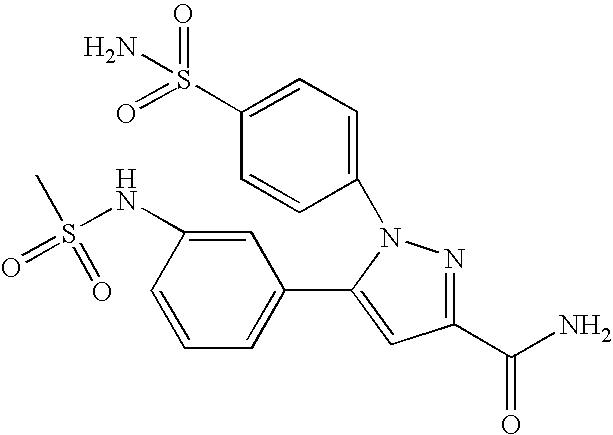 The method of claim 16 wherein the aqueous humor modulating agent is an adrenergic agonist. 29. 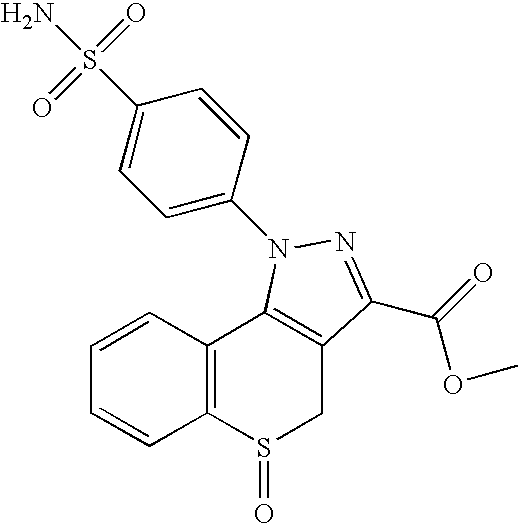 The method of claim 28 wherein the adrenergic agonist is epinephrine or dipivefrin. 30. The method of claim 16 wherein the aqueous humor modulating agent is a cholinergic agonist. 31. 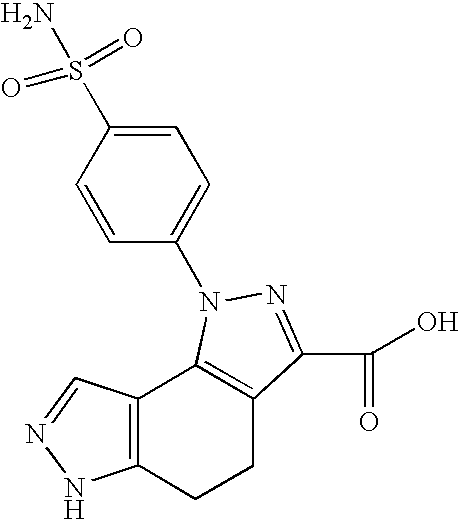 The method of claim 30 wherein the cholinergic agonist is selected from the group consisting of pilocarpine, pilocarpine hydrochloride, carbachol, demacarium, echothiophate idodine, and physostigmine. 32. 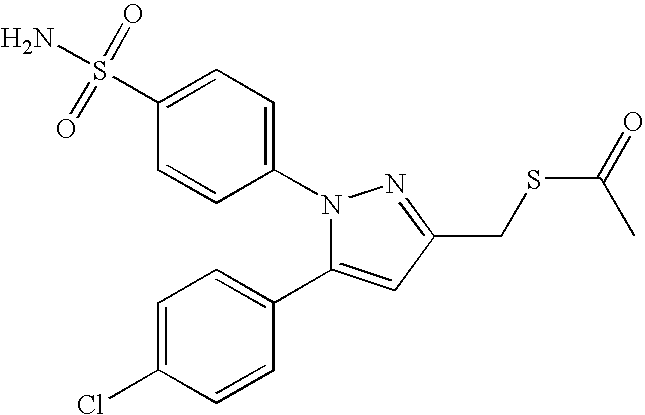 The method of claim 16 wherein the aqueous humor modulating agent is a carbonic anhydrase inhibitor. 33. 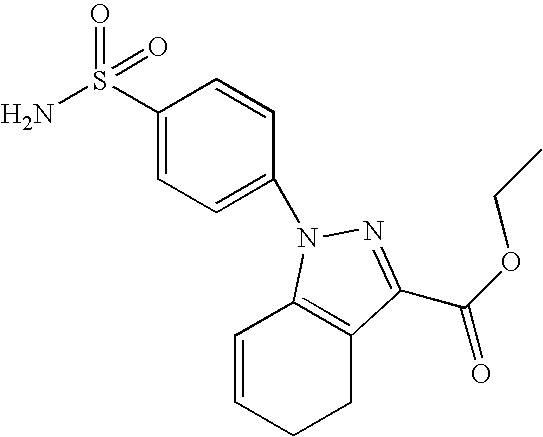 The method of claim 32 wherein the carbonic anhydrase inhibitor is a carbonic anhydrase I, II, or IV isosyme inhibitor. 34. 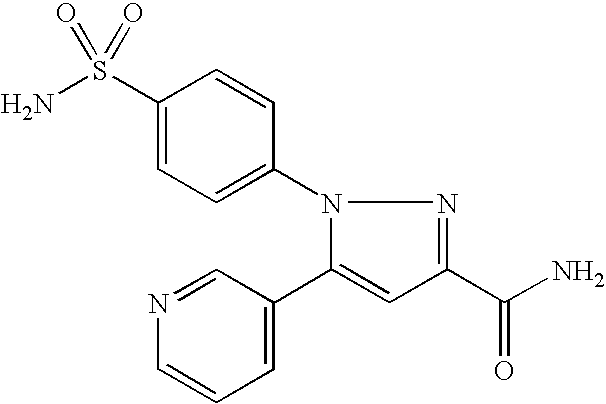 The method of claim 32 wherein the carbonic anhydrase inhibitor is selected from the group consisting of acetazolamide, methazolamide, dorzolamide hydrochloride ophthalmic solution, dorzolamide hydrochloride-timolol maleate ophthalmic solution, brinzolamide hydrochloride, dorzolamide, and brinzolamide. 35. The method of claim 1 wherein the carbonic anhydrase mediated disorder is edema. 36. The method of claim 9 wherein the edema is associated with a disorder selected from the group consisting of congestive heart failure, drug induced edema, open angle glaucoma, secondary glaucoma, acute angle closure glaucoma, epilepsy, altitude sickness, familial periodic paralysis, metabolic alkalosis, optic neuropathy, pseudomotor cerebri, and cystoid macular edema. 37. The method of claim 35 further comprising administering to the subject a second agent that is a diuretic. 38. 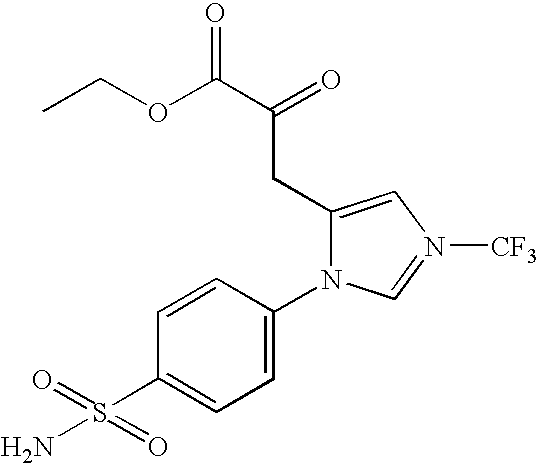 The method of claim 37 wherein the diuretic is selected from the group consisting of furosemide, bumetanide, ethacrynate, torsemide, chlorothiazide, hydrochlorothiazide, indapamide, metolazone, spironolactone, triamterene, amiloride, ethacrynic acid, acetazolamide, methazolamide, brinzolamide hydrochloride, dorzolamide, and brinzolamide. 39. The method of claim 1 wherein the carbonic anhydrase mediated disorder is altitude sickness. 40. 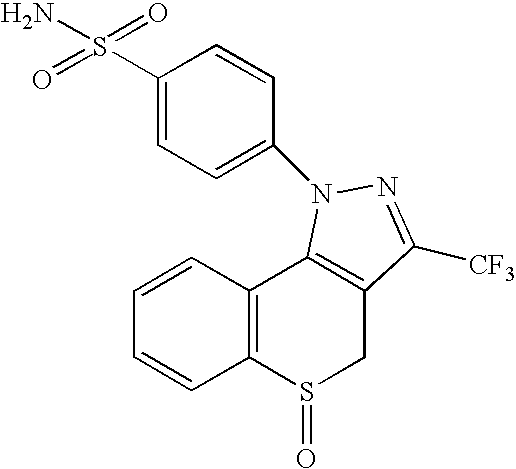 The method of claim 39 further comprising administering to the subject a second agent that is a carbonic anhydrase inhibitor selected from the group consisting of acetazolamide, methazolamide, brinzolamide hydrochloride, dorzolamide, and brinzolamide. 41. The method of claim 1 wherein the carbonic anhydrase mediated disorder is periodic paralysis. 42. The method of claim 41 wherein the periodic paralysis is hypokalemic periodic paralysis. 43. The method of claim 41 wherein the periodic paralysis is hyperkalemic periodic paralysis. 44. The method of claim 41 further comprising administering potassium to the subject. 45. The method of claim 1 wherein the carbonic anhydrase mediated disorder is cystine calculi. 46. The method of claim 1 wherein the carbonic anhydrase mediated disorder is uric acid calculi. 47. The method of claim 45 or 46 further comprising administering to the subject a second agent that is a diuretic. 49. The method of claim 1 wherein the subject is selected from the group consisting of a human, companion animal, zoo animal and farm animal. 50. The method of claim 49 wherein the subject is a human. 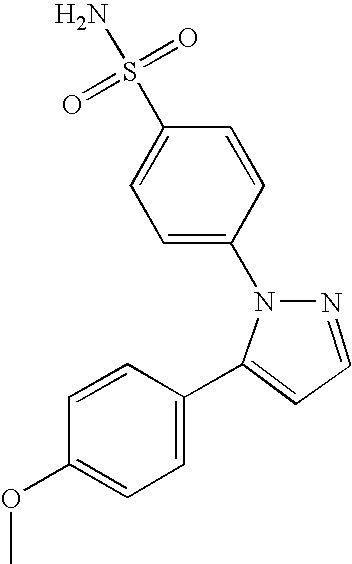 BE1004835A5 (en) 1993-02-09 New use antagonists 5ht-3. 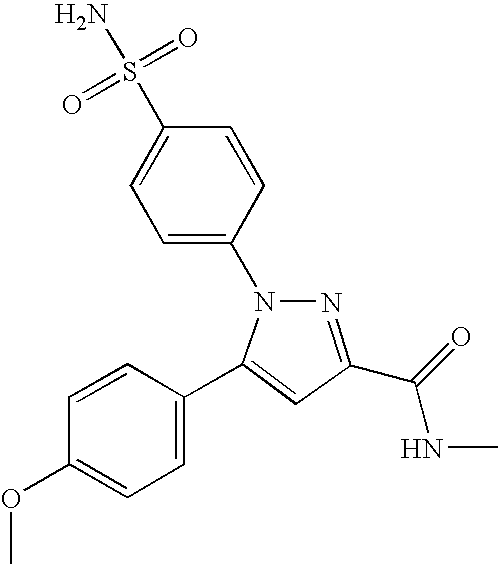 ES2149767T5 (en) 2005-06-16 New medical use for tachykinin antagonists. 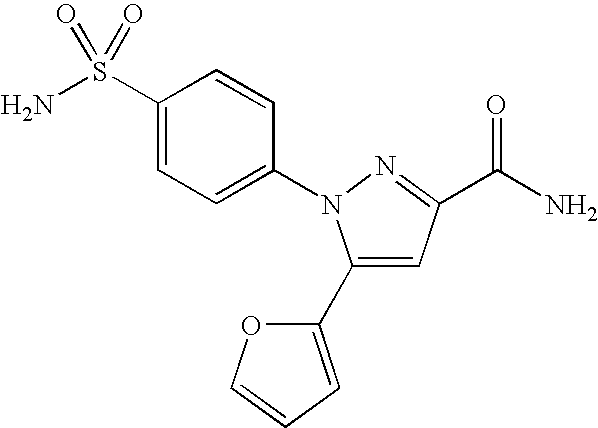 ES2263816T3 (en) 2006-12-16 Compositions for the treatment of disease d eparkinson containing CB1 receptor antagonist and a product that activates the depaminergica neurotransmission in the brain.